Lately I’ve been cooking a lot with chocolate – brownies, biscotti, more brownies – I was really craving oatmeal raisin cookies after this blog post on Smitten Kitchen. I tried the recipe from Friends (I’m not sure if it was an official Friends recipe though, lol) a couple of years ago and they were indeed the best oatmeal raisin cookies ever. I don’t know why it took me such a long time to make them again, they are perfect cookies. I used the recipe from A Spoonful of Sugar in the end and it turned out some gorgeous cookies – crumbly, chewy and crispy. The only thing I’d change about this is the amount of sugar, as they are a bit too sweet, even for me. I think next time I will go down to 200g in total of brown sugar. The mixture was quite dry anyway so I think taking out the sugar will help next time. The beauty of this recipe is that it makes LOTS of cookies, my batch made about 45 – probably more if I hadn’t made the first batch bigger than I should have, the cookies spread out quite a bit when they bake. I froze half of the mixture. To do this form into dough balls, freeze on a tray and then chuck them in a freezer bag – you can cook them from frozen (I’d double the cooking time for this). I like doing this, nothing cheers up a bad day like fresh cookies made with no effort. 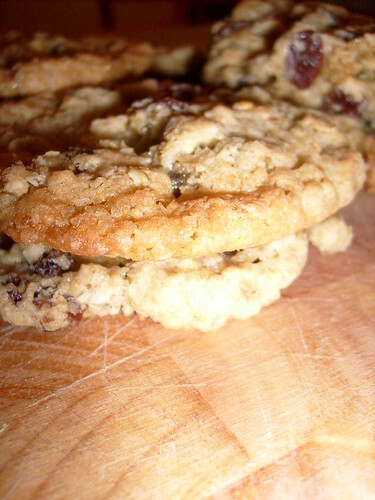 I think next time I am going to experiment with a bit of lemon zest or maybe cranberries and raisins.